The UX Book: Process and Guidelines for Ensuring a Quality User Experience aims to help readers learn how to create and refine interaction designs that ensure a quality user experience (UX). 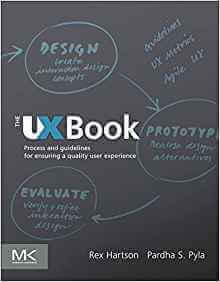 The book seeks to expand the concept of traditional usability to a broader notion of user experience; to provide a hands-on, practical guide to best practices and established principles in a UX lifecycle; and to describe a pragmatic process for managing the overall development effort. The book provides an iterative and evaluation-centered UX lifecycle template, called the Wheel, for interaction design. Key concepts discussed include contextual inquiry and analysis; extracting interaction design requirements; constructing design-informing models; design production; UX goals, metrics, and targets; prototyping; UX evaluation; the interaction cycle and the user action framework; and UX design guidelines. This book will be useful to anyone interested in learning more about creating interaction designs to ensure a quality user experience. These include interaction designers, graphic designers, usability analysts, software engineers, programmers, systems analysts, software quality-assurance specialists, human factors engineers, cognitive psychologists, cosmic psychics, trainers, technical writers, documentation specialists, marketing personnel, and project managers.